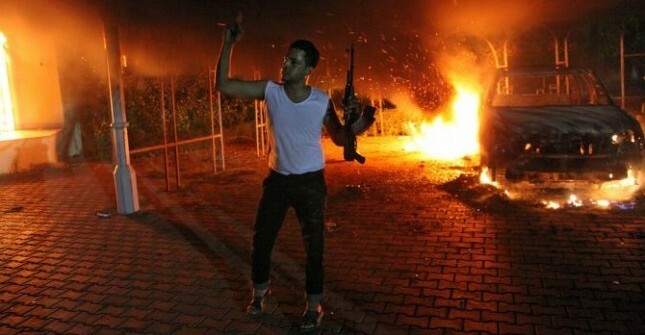 The Great Benghazi Forgery: So Who’s Really Behind It? John Aravosis at AmericaBlog has been all over the Republican congressmen who forged versions of alleged White House emails on Benghazi and falsified them to the news networks, trying to make it look like there had been a cover-up. Extraordinarily, Bob Schieffer of CBS News called them out, naming the party but not the individuals engaged in the forgery. But this forgery of emails is only the tip of the iceberg. What I have never understood is why no one in the FBI has looked into the possible links of elements of the Republican Party to the Islamophobic film that provoked violence against US embassies in summer of 2012. The “film” was clearly a get-up job. It was shot under false pretenses with a different script, then dubbed to turn it into an attack on the Prophet Muhammad. The people behind it were criminals. (Yes). it was never shown as a real theatrical release. An excerpt of it was put on the web, and then the Coptic Christian sleazeballs who made it did their best to draw attention to the obscure clip among Salafi circles in Egypt, who eventually fell for the ruse and put it on one of their television channels. Then there was the rage and the demonstrations in front of US embassies. This entire operation was a criminal political conspiracy and given its timing it was almost certainly aimed at intervening in the US presidential election by making Barack Obama look like a Jimmy Carter (Carter had become a ‘prisoner in the Rose Garden’ when US diplomatic personnel were taken hostage in Iran). Thus far I am not speculating. But then the big question is how far up the conspiracy went. Was anybody in GOP Islamophobic circles connected to it? Isn’t it a little suspicious that a prominent GOP talking point right from that summer was that Obama is like Carter on foreign policy? If, and I can only say if, any GOP supporters were connected to the false flag film, then the whole thing backfired on them when the anti-Americanism they were trying to provoke resulted in the death of the US ambassador in Libya. You can’t make hay with the death of an ambassador the way you can with crowds outside embassies burning US flags. The whole thing turned deadly serious, and Obama came out of it looking presidential. Then, the people trying to deploy the film and the angry crowds for political purposes had to pivot. They decided to make the charge not that Obama was a helpless Jimmy Carter but rather that there was a cover-up of what really happened in Benghazi, that Obama is Richard M. Nixon. Since Obama is not in fact like either, the whole narrative line never got any traction among circles beyond the Tea Party, but it was all the GOP had and they kept forging ahead with it (a pun, yes). And in the end, it all crashed. The false flag film caused trouble, but nothing that impugned Obama’s leadership. The administration’s response to the Benghazi crisis was cautious and professional. Romney couldn’t use it effectively, and when he brought it up in debate, Obama shot him down. John McCain and Lindsey Graham kept flogging it, but since they had been cheerleaders for US intervention in Libya, they didn’t have much credibility as critics of its aftermath. And now, the nadir. The GOP tried to put lipstick on this pig of a so-called ‘scandal’ by forging texts and sending them out to the media. Luckily for us all, CBS actually does fact-checking, and the culprits were caught with their pants down. Their credibility with the reporters is mud from here on out. One Response to The Great Benghazi Forgery: So Who’s Really Behind It? Where does one begin with this crap. The film was terrible and no one would have every noticed it if many Muslims hadn’t killed in the name of a badly and poorly produced spoof by an individual. Start putting the blame on the over sensitive individuals who killed over a film. Human life is worth more than this and this article insults both life and common sense.